Our absolute focus is on helping our customers design rings they and their partners will love. We’ll work closely with you to understand your and your partner’s taste, style, colour preferences, practical requirements and other considerations that go into creating a ring you’ll adore. Here you can learn more about choosing the right precious metal. Our rings are made to order and we only use recycled or fair trade precious metals and ethically sourced and processed diamonds and gemstones. For an extra special touch, we also offer exceptional quality engraving. That can be in the form of either a pattern on the outside (that many of our customers design themselves) or an inscription or meaningful symbol on the inside. How long will it take to make my wedding ring? 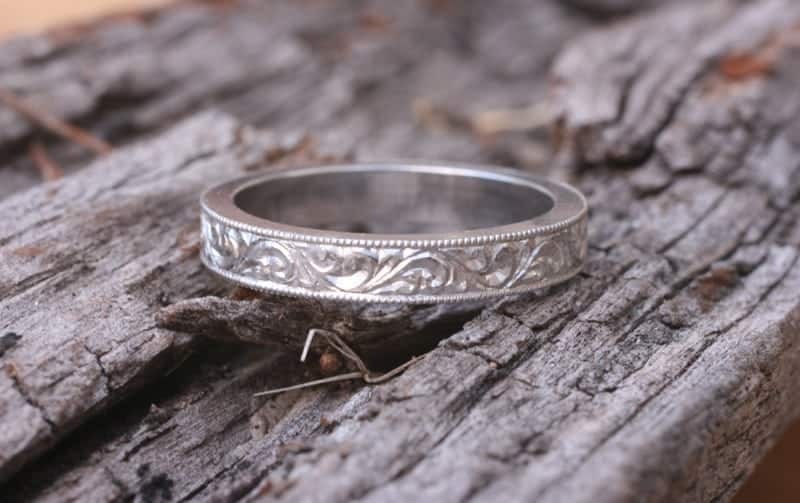 We can usually make a wedding ring within three to four weeks. However it’s always a good idea to allow a longer lead time – particularly for complicated designs and those that include engraving. 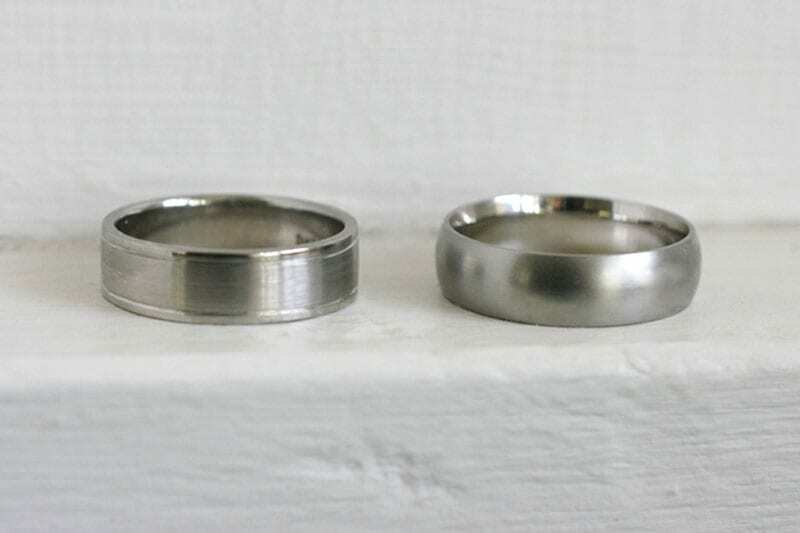 Both these platinum wedding bands were handmade. The flat band (left) has grooves and a wire-brush finish. The half-round band on the right has a matte finish. 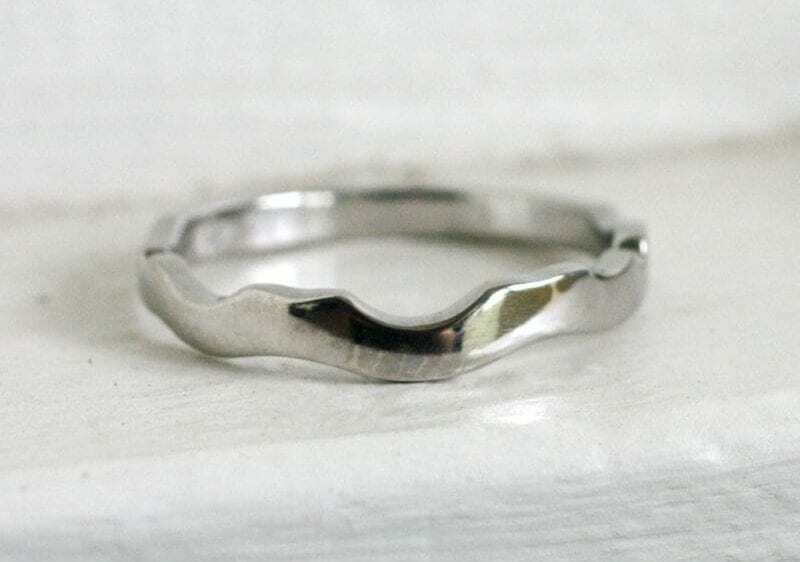 A very simple half round or flat wedding ring can be handmade quite quickly if needed. The best place to start is to get in touch so we can give can give you a more accurate time estimate. How much do handmade wedding rings cost? There isn’t a simple answer to this question as there are so many variables. Metal type, finger size, diamond or gem size, colour and quality and many other things can impact on the finished price. Nonetheless we’ve put together some guidelines below to give you an idea of costs. Simple half round or flat bands with minor variations. Plain flat band on the left with a wire-brushed finish. 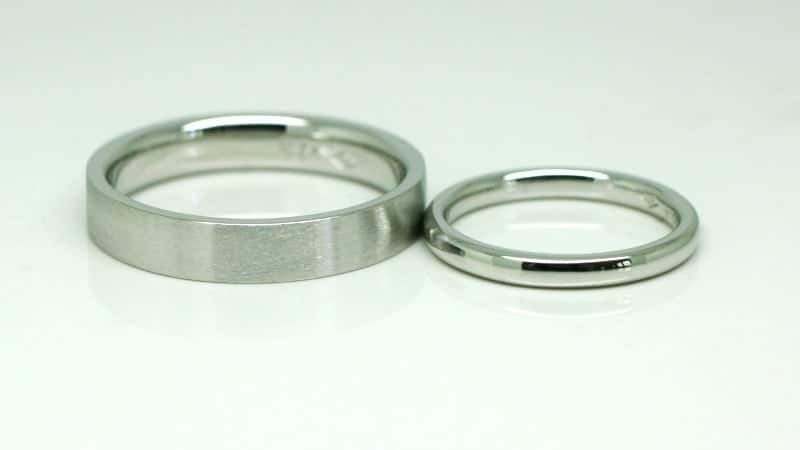 Round profile wedding ring one the right with a polished finish. Both are made with recycled platinum. Women’s rings are typically 2mm to 4mm and men’s 5mm to 7mm. There are exceptions (particularly if there is no engagement ring) but these are the most commonly requested widths. Fitting even a simple wedding band to an engagement ring can take a lot of skill, especially when the engagement ring setting doesn’t have plain sides. There is no ‘one price fits all’ in this category. However, a simple, unadorned fitted wedding ring is usually $200 to $300 more than its simpler counterpart (above) and more with engraving and diamonds or gemstones. Please note that if you would like to have a fitted wedding ring made we’ll need to borrow your engagement ring for a few weeks to make sure the two go together perfectly. The good part about that is you get a bonus clean and check. 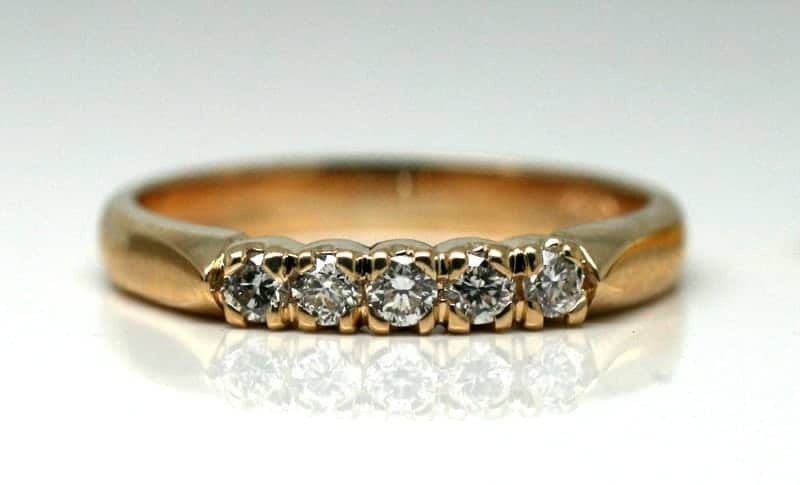 This diamond set recycled 18 carat gold wedding band has enough sparkle to be worn on its own and still really stand out! When it comes to more elaborate wedding rings, it’s difficult to suggest a general price range. 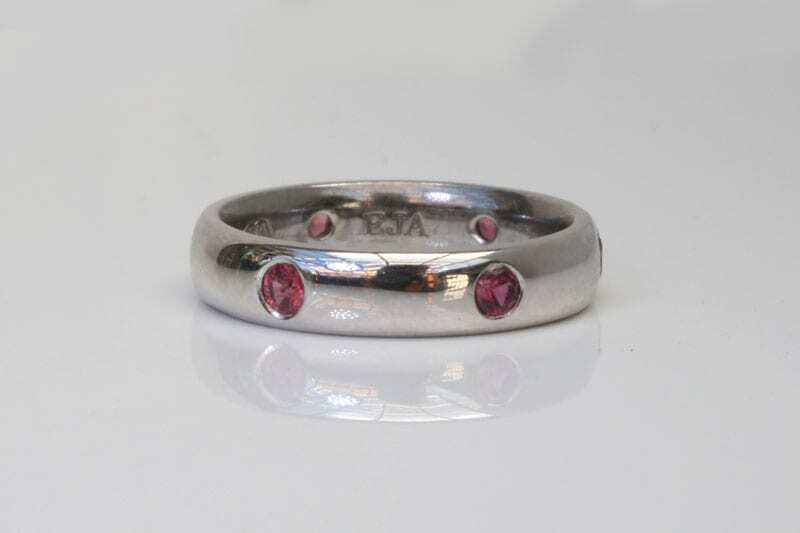 The Fair Trade rubies in this simple platinum band make this ring something special. Rings with multiple diamonds or gemstones take a lot longer to set. Two tone rings can take more time to make and so on. There are so many variables that can affect price – it’s best to ask us for a quote. Send us an email (preferred) or feel free to call us during business hours on 07 3379 2596. This otherwise ordinary flat wedding band was completely transformed with engraving and milgrain edging. Click on the image to learn more about this ring. Engraving is often overlooked as a way to make an otherwise plain ring uniquely beautiful. We can put words on the inside of your band, fingerprints, symbols – whatever you can imagine (as long as it fits). The outside can be engraved with all manner of designs from simple to intricate. Prices range from $30 for a simple thing like the date inside the ring to anything up to $600 for a complex design on the outside. Click the button below to visit our gallery for more inspiration. To discuss your options and request a quote for your handmade wedding bands, please drop us quick email (preferred), or feel free to call us during business hours on 07 3379 2596 with us. To help you along your way choosing and designing your wedding or commitment rings, we’ve created this detailed guide. Click the button below to request your copy.